Beans. The Rodney Dangerfield of of the food world. They get no respect. Though poems have been written about them, they are the sort of poesy that brings unwanted parental attention upon recitation. : Beans, beans, the musical fruit …. Beans, beans, good for your heart … You can sing them both, can’t you? Beans need the PR that prunes got a few years back … dried plums, anyone? Though beans are highlighted in practically every cuisine worth mention, for most of us, they are relegated to side dish just meant to round out a meal. And here I am … relegating them to side dish. Irony. Well, no, I am not relegating anything. Pat is. How to get in good with your mother-in-law? Throw her under the bus. These are Pat’s beans. Pat Smith is my mother-in-law and she introduced me, nay, opened my eyes to the deliciousness that is these baked beans. Though the pic above has the beans as a side, these beans are my main. Fresh and hot? to die for. Cold out of the fridge for breakfast? move over coffee. Yes, these beans are that good. Pat and Jim (the father-in-law and avid diner) were married in 1969 in Southern California. Friends gave her a recipe shower and this bean recipe was one of her gifts. With only five ingredients, they are easy enough for anyone to throw together. With only five ingredients, this recipe is easy to dismiss as “just like any other beans.” Ah, you’d be wrong. They are sweet and smoky and spicy and creamy. They compliment the menu for any picnic or cookout. Without further ado, here thee be. Ah, one last thing: photog Stephanie has decided summertime is time for beach travel and concerts. Whatevs. So, it’s just me and you’ll see that I got into my zen cooking mode and didn’t take too many pictures … or too many that I’d claim as my own. But again, these beans are not rocket science so step-by-step would just be to feed my love of all things bean … Okay, now enjoy. 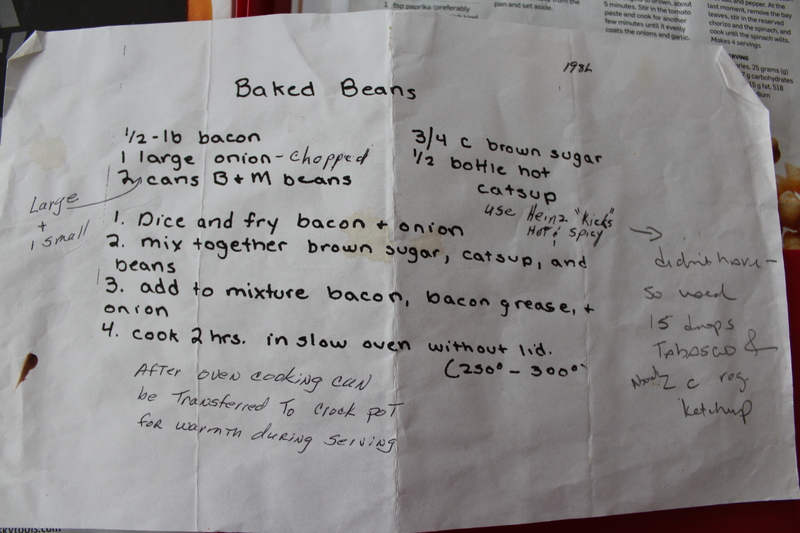 Here’s the handwritten recipe (unknown writer); this version is from 1986 with Pat’s notes on the left. After my first taste of these beans, I asked for and received this copy and added my own chicken scratch on the right. The evolution of a recipe speaks to the cook and the times … adapt and improve. You’ll see that the recipe below is not exactly as written. I’ve adapted the recipe to what’s available and my own taste… and Pat tasted this batch and deemed them worthy of slapping her name on so there you go. 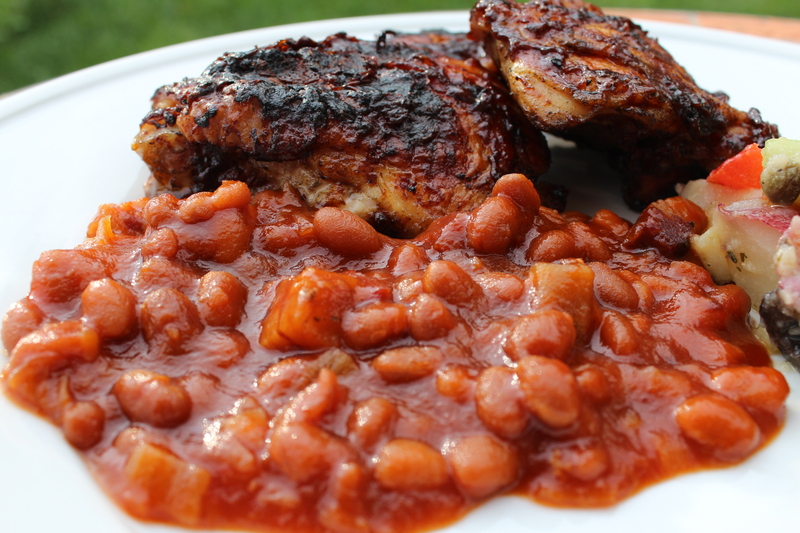 One of my changes is to use vegetarian baked beans. There is nothing more foul in a can o’bean love than that gelatinous whiteness that is supposed to be pork. I’ll add my own real pork, thankyouverymuch. Also, spicy ketchup – in this case, half a 14 oz. bottle of Heinz Hot and Spicy – is sometimes not available. Stress not; just use regular ketchup and add Tabasco to suit your palate. This recipe can handle a pretty decent amount so don’t be shy. Finally, please note that I am using my Crockpot for this batch. It’s July and in the 90s, so I was loathe to tempt fate our poor air conditioner by heating the kitchen too robustly. Though wetter than if baked, these beans suffer no ill effects after 6 hours on high with the added bonus of a cool kitchen. First and most important is cooking the bacon and onions together. This adds the carmelized, meaty flavor that set these beans apart This batch has the added over-the-top goodness of BD’s home smoked bacon. Though any high-quality bacon will work (you want more bacon flavor than salted fake smokiness), this batch was exceptionally tasty because the bacon was cut into chunks, something I think I will keep doing as long as I have an ongoing supply of the home-smoked stuff… hint! hint! In my trusty cast iron skillet, I cook the bacon and onions until both have browned edges and the bacon is cooked to firm texture… Gooby bacon is bad joo-joo. Now for the tough part, throw it all together, mix it up, turn to high, and put the lid on. Done! Call me in six hours. If cool temps prevail in your neck of the woods, this does benefit – gild the lily as it were – from baking in the oven. It’s a textural thing but flavors are equally tasty so fret not if you’re Crockpotting it. One last picture of these lovelies. Enjoy! 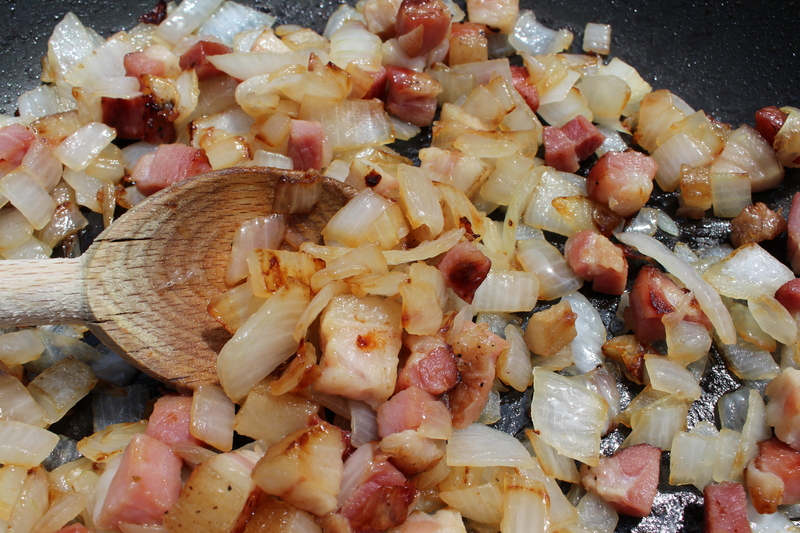 Saute the bacon and onion on medium heat until browned and the bacon is cooked through. If baking, cook uncovered at 300F for 2 hours. If using a slow cooker, cook on high for 6 hours. This entry was posted in Side Dish and tagged bacon, Barbecue, beans, cookout, crockpot, family dinner, family favorite, family recipe, feed a crowd, heirloom recipe, ketchup, kid friendly, Make-Ahead, onions, Picnic, slow cooker, spicy, tradition. Bookmark the permalink.